The rapper's crew allegedly clashed with Cash Cash in the early hours of Saturday (12Mar16) following a heated dispute over set times on the Inception at Sea bash, which sailed from Miami, Florida to the Bahamas. According to Billboard.com, Tyga delayed the start of his set by over an hour, overlapping with Cash Cash's scheduled show, which had been due to take place on the same stage. The argument turned physical and resulted in Cash Cash members Samuel Frisch and Jean Paul Makhlouf sustaining injuries, which they showed off in a series of Twitter posts on Saturday (12Mar16), after having to cancel their performance. "Last night JP was violently physically assaulted by @tyga 's team mins before our set. Thank u to everyone who helped out. JP is recovering. We are extremely bummed we couldn't play for our fans and were completely disrespected by @tyga and his team. More on this coming soon..."
They also promised to share video footage of the "barbaric and uncivilized" altercation. Tyga's representatives have yet to respond to the allegations, but on Monday (14Mar16), Cash Cash's publicist doubled down on the band's accusations in a statement to Billboard, revealing Makhlouf was left with a concussion. "Early Saturday morning members of Tyga's touring crew physically assaulted Cash Cash during an altercation backstage at Inception at Sea cruise festival," the message reads. "Members affected include Samuel Frisch, and Jean Paul Makhlouf. Jean Paul Makhlouf suffered a concussion, injured kidney, alongside bruises to his head and body following the scuffle." 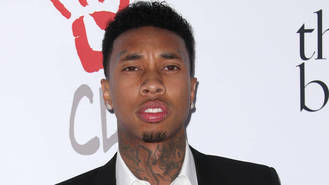 According to the publicist's account, a Tyga crew member was filmed kicking Jean Paul in the ribs, while another Tyga crew member "slammed him to the ground, punching and kicking his head and body while on top of him". "Cash Cash was unable to perform their set and Makhlouf was also forced to miss their following show to recover from the incident," the rep adds. It is not known if Cash Cash filed a police report, but the group left the Bahamas on Sunday (13Mar16), before the cruise ship headed back for Miami on Monday.